Actually, the name on the cover of this book is את Eth Cepher, which has even more meaning than we intended. Let us begin by considering the four levels of meaning in the Hebrew language. PSHAT: The word Cepher (in the Hebrew סֵפֶר samek-phe-resh) means properly, writing (the art or a document); by implication, a book:--bill, book, evidence, letter, register, or scroll. REMEZ: However, this is not its only generation; the same configuration, סֵפֶר samek-phe-resh, yields another definition, meaning, properly, to score with a mark as a tally or record, i.e. (by implication) to inscribe, and also to enumerate; intensively, to recount, i.e. celebrate: to commune, to count or account; to declare, number, to reckon, scribe, show forth, speak, talk, or to tell. And he brought him forth יָצָא abroad חוּץ, and said אָמַר, Look נָבַט now toward heaven שָׁמַיִם, and tell סָפַר (cepher) the stars כּוֹכָב, if thou be able יָכֹל to number סָפַר (cepher) them: and he said אָמַר unto him, So כֹּה shall your seed זֶרַע be. From this same concept of numbering, the word has been used to mean census as well. And Solomon שְׁלֹמֹה numbered סָפַר (cepher) all the strangers אֱנוֺשׁ גָּר that were in the land אֶרֶץ of Israel יִשְׂרָאֵל, after אַחַר the numbering סְפָר (cepher) wherewith David דָּוִד his father אָב had numbered סָפַר (cepher) them; and they were found מָצָא an hundred מֵאָה and fifty חֲמִשִּים thousand אֶלֶף and three שָׁלוֺשׁ thousand אֶלֶף and six שֵׁשׁ hundred מֵאָה. So, in a general sense, the word Cepher means numbered writings – a collection in order, if you will. Dictionary.com describes the word Cepher (Sefer) to mean any book of Hebrew religious literature. DARASH: Compare the name Cepher with the more common word Bible. The Cepher is a book of Hebrew religious literature. Bible is derived from the Greek word βιβλίον biblion. Note that this word is distinguished from τὰ βιβλία τὰ ἅγια ta biblia ta hagia (“the holy books”), but its origin is something less than Hebrew religious literature. The literal meaning of the word at its origin was “paper” or “scroll” and it was named after the Egyptian papyrus shipped from the seaport of Byblos. The most important thing for the scholar is to compare the world view associated with the name, as one is Greek and the other Hebrew. The decision to name the collection a Cepher rather than a Bible is the result of the conclusion that all of the scriptures including the Brit Chadashah (New Testament for Bible readers) had its origin in Hebrew. When Pilate therefore heard that saying, he brought YAHUSHA forth, and sat down in the judgment seat in a place that is called the Pavement, but in the Hebrew, Gabbatha. And they had a king over them, which is the angel of the bottomless pit, whose name in the Hebrew tongue is Abaddon, but in the Greek tongue has his name Apollyon. For those Bereans (Ma’aseh (Acts) 17) who are convinced that YAHUSHA HAMASHIACH spoke Greek, there is one reference that conclusive indicates he spoke in Hebrew, yet there is no place in all of the Brit Chadashah indicating he spoke a single word of Greek. And when we were all fallen to the earth, I heard a voice speaking unto me, and saying in the Hebrew tongue [bold added], Sha’ul, Sha’ul, why do you persecute me? It is hard for you to kick against the pricks. Sod: No discussion should be completed without addressing the Sod meaning of the term Cepher, and there are four things of interest here in the use of the word Cepher. We begin with the gematria of Samek-Phe-Resh, which is Samek=60, Phe=80, Resh=200, or 340. The word Cepher then has the same gematria as the word נֵצֶר netzer, meaning, a branch. Compare נֵצֶר netzer with the word Nazareth (נצראת) or he of Nazareth (ה'נצרי), or followers of the Branch (ה'נצרים). It is of some interest to the followers of the Alef-Tav, that the correct spelling of Nazareth (נצראת) is a combination of netzer and eth (alef-tav) meaning the divine branch. Here is wisdom (חכמה chokmah). Let him that has understanding count (יחשב yachasav – meaning to reckon the genealogy of) the number (מספר ma’cepher) of the beast: for it is the number (מספר ma’cepher) of a man (אדם adam); and his number (ומספרו u’ma’cephera) is Chi, Xi, Stigma. Let’s take one more moment on this passage. Suppose we were to take the other meaning for cepher used here (book) and we replaced the Greek Chi, Xi, Stigma with the Hebrew letters of the same Gematria Chi=600 (in Hebrew, mem safit), Xi=60 (in Hebrew, samek) and Stigma=6 (in Hebrew, yod), or יסם, which means damned. Here is wisdom. Let him with understanding reckon the genealogy of the book of the beast: for it is the book of man, and his book is damned. A couple of other observations. 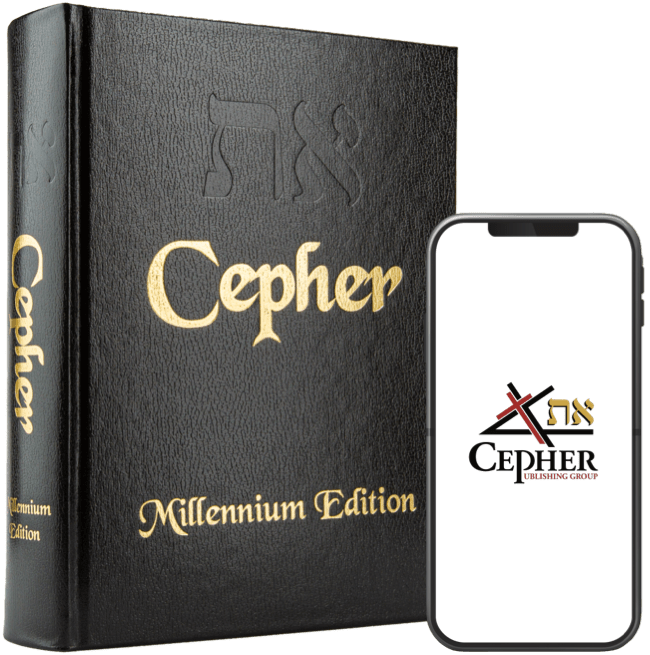 One derivative term of the word Cepher is the word Cepherad (ספרד), the tedushah of which means the door (dalet) to the book (cepher) (the chief words of the shepherd), the literal which means the numbered ones, or the ones of the book, but which is found in scripture only once, in the book of Obad’yahu (Obadiah). But upon Mount Tsyion shall be deliverance, and there shall be holiness; and the house of Ya`aqov shall possess את their possessions. 18 And the house of Ya`aqov shall be a fire, and the house of Yoceph a flame, and the house of Esau for stubble, and they shall kindle in them, and devour them; and there shall not be any remaining of the house of Esau; for YAHUAH has spoken it. 19 And they of the south shall possess the Mount of Esau; and they of the plain the Pelishtiym: and they shall possess the fields of Ephrayim, and the fields of Shomron: and Binyamiyn shall possess Gil`ad. 20 And the captivity of this host of the children of Yisra’el shall possess that of the Kena`aniym, even unto Tsarephath; and the captivity of Yerushalayim, which is in Cepharad, shall possess את the cities of the south. 21 And saviours shall come up on Mount Tsyion to judge the Mount of Esau; and the kingdom shall be YAHUAH’S. “Spanish” and Cepharad still means “Spain” in modern Hebrew.